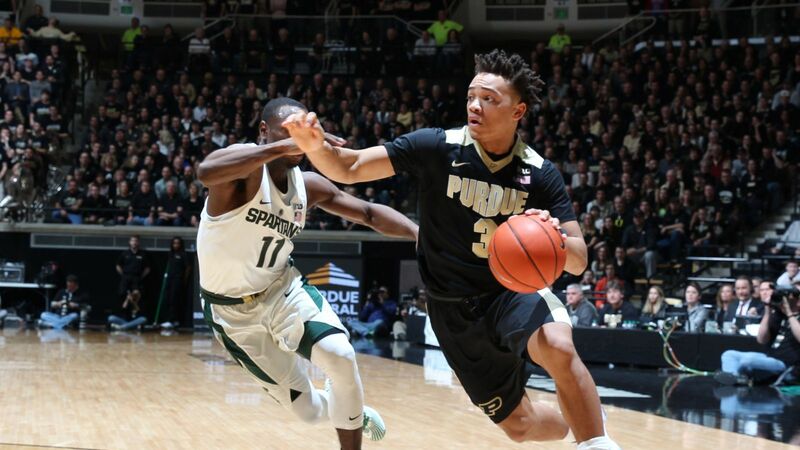 It has been a blissfully successful summer for Purdue basketball. Carsen Edwards acquitted himself well in the U-19 World Cup in Egypt where he won a Bronze Medal. Now the complete team (sans Matt Haarms and the immortal Tommy Luce) is on the cusp of a gold medal and World Championship at the World University Games. They are a spotless 10-0 counting their three exhibition victories, and only Lithuania stands in the way. Lithuania reached the championship round by tying with the same Israel team that is really the only team to challenge PurdUeSA. They beat Israel 79-70 in group play as well as Ukraine 76-71, Russia 112-71, and Mozambique 122-35. Their only loss was to Australia 84-82. Australia has reached the 9th place game to play as the best non-championship round team against Canada. Here in the medal rounds Lithuania has survived a pair of close game. They beat Argentina 72-70 on a late basket. In the semifinals they faced Baltic rivals Latvia and emerged victorious 77-75 on a basket by Evaldas Saulys with 15 seconds remaining. Despite the loss to Australia, Lithuania was one of the medal favorites coming in along with the United States and Germany. Ignas Vaitkus is their leading scorer at a little over 14 points per game. They have averaged 88 points per game as a team and have shot 39% form three. Vince Edwards and Carsen Edwards have both been better and have carried the U.S. in the medal rounds. Vince Edwards is averaging 19.7 points per game to go with a 54% clip from three. Carsen is at 16.6 points per game and is shooting 53% from the floor. As a team PurdUeSA is 45% from long range. This may come down to fatigue. This is the third game in three days for both teams and Lithuania has survived two very close calls. Purdue played an extra five minutes on Sunday, but against Serbia they were able to rest starters for much of the second half. Isaac has played only 14 minutes against the Serbians, while Dakota Mathias and the Edwardi were the only players over 20 minutes. This will be a fun one. We will likely see more of a crunch time lineup like we’ll see during the regular season. That’s what happened against Israel, as Aaron Wheeler and Eden Ewing did not play. Expect a shorter bench unless we get up by a lot. Time to go win a world championship! Next Story → Did Lakers sign Kentavious Caldwell-Pope to appeal to LeBron?